Transform The Way You Do Business - Making Your Operations Faster & More Efficient With Googles Powerful Online Applications! Finally, A Tutorial Series Thats GUARANTEED To Help You Master Google Infrastructure & Make Business Communications & Information Sharing A Breeze! * Are you looking for a better way to manage emails, document sharing, websites, domain registration and more? * Would you like to feel confident that all your employees were grouped correctly to securely receive and share essential business information? * Do you want to make business communication faster and more user friendly with a complete system that manages the full spectrum of tools you require? If you run a business with one or more employees, then you face the challenge of ensuring that all your business stakeholders can access the essential information they need for their roles. While you may find there are different solutions available, for many small businesses these solutions are simply too expensive to justify their use in their day to day operations. Are On The Endless Search For A Quality Solution? Im sure you have tried some of the so called answers, but if you need a real solution, then you need to explore an online option that doesnt rely on you incorporating expensive infrastructure purely for handling emails, electronically storing business documents and hosting your own websites. What you need is a solution that is web based - offering the benefits of having your own virtual intranet - without the crippling expense that puts this option out of reach of many small or online businesses. Hello, my name is Deep Arora As a small business owner and online business expert - I too faced the challenges of how to email my employees and contractors, how to share business documents and information so that different groups could find what they needed and how to manage websites, domain names and more. I worked with several different options and did seriously consider setting up my own intranet for my business - at great expense- using my own server space and IT people to run it. The potential cost of such a project escalated rapidly and I was facing a tough decision about how badly did I want or need to implement these measures. My search for a quality solution that was cost effective led me to try a number of different options. What I discovered was that there were many programs that provided business communication tools, email, document transfer facilities and web and domain options. What I needed was a way to do this without paying for an intranet structure that necessitated server rental, site hosting and expensive implementation and maintenance. I wanted more bang for my buck - I was running small business and regularly outsourced work to contractors. In doing this I needed a way to create groups for user access to different business documentation and sensitive information. I needed to find a solution that would keep costs down while providing the maximum number of tools to achieve the goals I had set for my business and ensure that I could work cost effectively towards those goals. If you are in business for yourself, then Im sure these problems sound familiar. The search for a way to handle your business and ensure your employees have the information they need to do their work is problematic. While there are solutions available - the cost puts them way out of reach for small business owners. You know that there is a need to manage the different aspects of your business, but doing so successfully is a challenge. Without implementing the right tools - youll find that you fall short in one or more of these areas. The problem then is how to implement all these things without resorting to patched together solutions that fall over at the most critical point in time. Your business could quickly start running into trouble if you cant get these things working for you and you fail to find a business solution that genuinely delivers the full range of tools you need. If youve tried to secure an efficient solution, then you are probably tearing your hair out by now trying to work out how to get results without the cost making your goal unachievable. You need a solution that cuts to the heart of what you need and provides you with REAL answers! I was where you are - I understand how it feels - so now let me show you. When I tapped into the power of the Google infrastructure I finally discovered a solution that allowed me to master my online business activities. Best of all - the service was online - so I eliminated costs of server space, expensive web hosting and more! Sounds great - but how can you implement these tools in your business? Well, thats where I can help. Not only have I uncovered this solution for your business needs - Ive put together a package that will let you gain all the essential knowledge you need to successfully utilise these business tools! In fact, youll cover everything you need to know to master the invaluable Google Infrastructure - Ive mastered these powerful online https://www.tradebit.com you can too! Get The Tools You Need To Boost Your Online Business Operations Dramatically! Ive covered everything you need to know about the Google Infrastructure in my step-by-step series that walks you through the essentials of managing your business communications and data online. Once you take advantage of this unique information, youll understand precisely how to get the most out of the Google Infrastructure and how these powerful tools can assist you managing your business needs from day to day. Now youll finally have access to a training system that will help you to maintain your business - using more effective options for communication and data sharing. The Using Google Power For Your Business tutorials walk you step-by-step through a range of methods, techniques and options for harnessing the power of the Google tools. This information will help you truly take control and manage your business without outlaying masses of money to ensure you succeed! One of the greatest advantages with Using Google Power For Your Business is that these video tutorials demonstrate a wealth of information in an easy to follow, visual manner. Because all of us learn in our own way and at our own pace, the visual format and progressive structure of this learning series makes the process enjoyable. Very few of us have the time or patience necessary to sit down and read a long winded eBook. This can take days if not weeks - and if youre eager to start mastering the skills to use the Google Infrastructure tools, then you dont want to wait a second longer! Ive put this valuable information together in video format - so that you begin to take onboard this valuable information fast, via a straightforward visual format. Using Google Power For Your Business is a packagethat includesvideotutorials packed full of helpful hints, instructions, strategies, and methods to succeed with the full range of tools that are offered. If youre ready to take control and increase your knowledge of the Google Infrastructure - then its time to harness the power of these tools through my videos. This tutorial series will mean you CAN achieve results - its fast and easy - and it genuinely works! With the Using Google Power For Your Business video series, youll have the necessary tools to master your business operations. This is an invaluable opportunity to create quality results for your business with online applications that will significantly change how you approach your business communications and information sharing. So now Ill show you exactly why . This training is the perfect solution to build upon your business management and communications. If you want to continue doing the same things as you do now - youll find that taking the easy way out simply leads to the same results youre getting now.... But if youre ready to create the extraordinary success and create the results others have outlined in their testimonials - then now is the time to get rid of your scepticism and make a genuine, lasting change! You Can Get Started Today At One Low, Low Price! The cost of this program is negligible compared to the comprehensive, powerful and money saving information that this delivers! When you purchase your lessons youll truly get the information and resources you need to master the full range of Google Infrastructure tools and applications. If youre ready to truly turn around your online business activities once and for all - then you wont find a more comprehensive or effective learning system around! LESSON 2 - What services are available? Video three takes you through the essentials of using Gmail (email). This tutorial demonstrate steps to integrate your domain email with Google services (this covers changing the MX records). Video four will take you step-by-step through customizing your very own start page to make using these powerful tools easier. Every business needs a website these days. In video five, Ill cover everything you need to know about sites and site tools. Video six goes through the range of mobile settings available to help you upload information, messages and more via your mobile phone. Using email to communicate with employees and colleagues is an essential aspect of your business. Video seven will cover the range of services available with the Gmail (email) software. If you need to manage scheduling for employees and contractors, share events and make sure that your staff are up to date on whats coming up in the future - the calendar is an integral part of the Google package - this is what Ill cover in video eight. Video nine covers the all important sharing of documents, online collaboration and uploading of spreadsheets and other data using GoogleDocs. Keeping in contact with our employees and providing them with the means to communicate with you and each other is crucial. Video ten will help you use the full range of features offered in the Google Chat. To streamline user account creation - Video twelve will look more closely at bulk user creation, as well as other advanced tools. This is an incredible amount of information and all this could be yours for only $1.90! 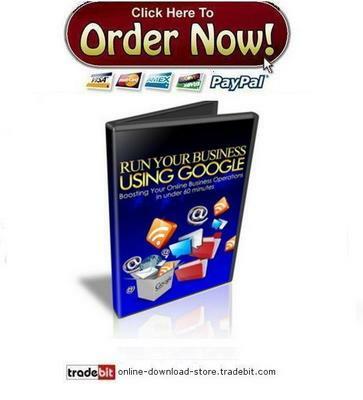 Run Your Business Using Google, Rr Included!